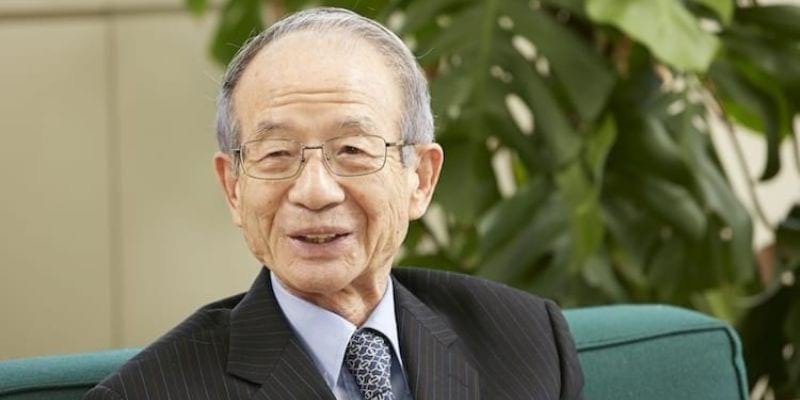 Ikujiro Nonaka (Nonaka Ikujirō; 10 May 1935) is a professor and author who is globally known for his theory of the knowledge-based management of companies. He is dedicated to helping organizations build knowledge that makes them competitive. He created the SECI model of knowledge dimensions, and his work laid the groundwork for the concept of Scrum Agile Methodology. Ikujiro Nonaka was born in Tokyo, Japan. He experienced the Second World War during his childhood. In that time, many children were evacuated from Tokyo to the countryside for their safety. Unfortunately, Ikujiro Nonaka was a victim of a strafe, but he luckily survived the attack. As a consequence of his experience in his childhood, his motivation was to defeat the United States by making Japan stronger than it was. Ikujiro Nonaka next argues that the only way to realize his idea is by bringing together the best aspects of both Japan’s and Western countries’ industry and management. He first attended a technical school and later studied Political Science at Waseda University in Tokyo. After his study, in 1958, Ikujiro Nonaka immediately got offered a position as a personnel manager at Fuji Electric, a Japanese electrical equipment company. He identified that at the plant he works, the personnel needs to improve their skills. For this reason, he implemented an adapted version of an American management training into his plant. The training popularized rapidly in the company’s headquarters and even reached universities in Japan. As a result, Ikujiro Nonaka was next collaborating with the Keio University in Tokyo for developing management curriculums for numerous companies in Japan. Ikujiro Nonaka’s mission was to make Japan great again with knowledge. He realized that to understand American methods and teach these to Japan, he must study in the United States. Dedicated to his mission, Ikujiro Nonaka saved money for approximately six years to study in the United States. Since he wanted to gain broad knowledge, he worked in various departments at Fuji Electric, varying from marketing and finance. In these six years, he additionally married a worker of Fuji Electric. In 1967, Ikujiro Nonaka moved to the United States to study consumer marketing at the University of California, Berkely. He obtained his MBA in 1968 and his Ph.D. in 1972, both at this university. In 1972, after he obtained his Ph.D., Ikujiro Nonaka moved back to Japan where worked as a professor. He lectured at Nanzan University from 1977 to 1979. Ikujiro Nonaka later worked for the National Defense Academy from 1979, and from 1982, he joined the faculty at Hitotsubashi University for six years. By 1984, a fellow student Hirotaka Takeuchi of the California University, Berkeley, invited Ikujiro Nonaka to attend a symposium on innovation at Harvard Business School. The symposium stimulated both Ikujori and Hirotake to research stories of people who created innovative solutions. Their findings were published in the Harvard Business Review article ‘The Knowledge-Creating Company.’ They argue that when companies create knowledge, it will have a competitive advantage. In 1997, Ikujiro Nonaka was chosen to Xerox Distinguished Professor of Knowledge at Haas School of Business at the University of California, Berkeley. He was the first to hold the Xerox Distinguished Professorship. In 2005, Ikujiro Nonaka established together with Hirotaka Takeuchi the Nonaka Institute of Knowledge, former Knowledge Institute. The company offers education programs to both businesses and business schools. Ikujiro Nonaka’s research on knowledge creation was outstanding and is internationally highly valued. His work comprises an examination of various concepts of the knowledge of Japanese and Western countries. He was a member of various Scientific Committees, including the Industrial and Corporate Change, the Journal of Management of Governance, and the Academic Association of Organizational Science. Ikujiro was additionally awarded many honors. He received the Innovation Luminary Awards of 2016. He was also awarded the Lifetime Achievement Award by Thinkers50, the Honorary Doctor of Laws by Waseda University, and he received the HEC Paris Honoris Causa Professor Award. Ikujiro Nonaka has published many books and articles in both Japanese and English on knowledge creation. He is ranked number 20 as Most Influential Business Thinkers in the Wall Street Journal. Ikujiro Nonaka currently lives in Japan, and he works as a University Professor at Waseda University. Ikujiro additionally is a Professor Emeritus at Hitotsubashi University. Publications and Books by Ikujiro Nonaka et al. 2014. Dynamic fractal organizations for promoting knowledge-based transformation – A new paradigm for organizational theory. European Management Journal, 321, 137-146. 2012. Leadership in organizational knowledge creation: A review and framework. Journal of Management Studies, 491, 240-277. 2011. The wise leader. Harvard business review, 895, 58-67. 2009. Perspective—Tacit knowledge and knowledge conversion: Controversy and advancement in organizational knowledge creation theory. Organization science, 203, 635-652. 2008. The quality of group tacit knowledge. The Journal of Strategic Information Systems, 171, 4-18. 2008. The knowledge-creating company. Harvard Business Review Press. 2008. Managing flow: A process theory of the knowledge-based firm. Springer. 2007. Why do firms differ. Knowledge creation and management: New challenges for managers, 129. 2007. Strategic management as distributed practical wisdom phronesis. Industrial and Corporate Change, 163, 371-394. 2006. Organizational knowledge creation theory: Evolutionary paths and future advances. Organization studies, 278, 1179-1208. 2006. Objectivity and subjectivity in knowledge management: a review of 20 top articles. Knowledge and process management, 132, 73-82. 2006. Knowledge creation and management: New challenges for managers. Oxford university press. 2005. The theory of the knowledge-creating firm: subjectivity, objectivity and synthesis. Industrial and corporate change, 143, 419-436. 2005. SECI, ba and leadership: a unified model of dynamic knowledge creation. Knowledge Management: Critical Perspectives on Business and Management, 2317, 16-29. 2005. Knowledge management: critical perspectives on business and management. Vol. 2. Taylor & Francis. 2004. Hitotsubashi on knowledge management. Wiley. 2003. The knowledge-creating theory revisited: knowledge creation as a synthesizing process. Knowledge management research & practice, 11, 2-10. 2002. A firm as a dialectical being: towards a dynamic theory of a firm. Industrial and Corporate change, 115, 995-1009. 2001. Making the most of your company’s knowledge: a strategic framework. Long range planning, 344, 421-439. 2001. Knowledge emergence. Knowledge emergence: Social, technical, and evolutionary dimensions of knowledge creation, 3-9. 2000. Enabling knowledge creation: How to unlock the mystery of tacit knowledge and release the power of innovation. Oxford University Press on Demand. 2000. A firm as a knowledge-creating entity: a new perspective on the theory of the firm. Industrial and corporate change, 91, 1-20. 1998. The ART of knowledge: Systems to capitalize on market knowledge. European management journal, 166, 673-684. 1998. The concept of “Ba”: Building a foundation for knowledge creation. California management review, 403, 40-54. 1998. Knowledge enablers. Knowing in firms: Understanding, managing and measuring knowledge, 173-203. 1998. A Theory of the Firm’s Knowledge-Creation Dynamics. 1997. Develop knowledge activists! European management journal, 155, 475-483. 1996. From information processing to knowledge creation: a paradigm shift in business management. Technology in society, 182, 203-218. 1995. The knowledge creation company: how Japanese companies create the dynamics of innovation. 1994. Organizational knowledge creation theory: a first comprehensive test. International Business Review, 34, 337-351. 1994. A dynamic theory of organizational knowledge creation. Organization science, 51, 14-37. 1991. Models of knowledge management in the West and Japan. 1991. Managing the firm as an information creation process. Advances in information processing in organizations, 4, 239-275. 1990. Redundant, overlapping organization: A Japanese approach to managing the innovation process. California Management Review, 323, 27-38. 1989. Managing innovation as a self-renewing process. Journal of business venturing, 45, 299-315. 1988. Toward middle-up-down management: accelerating information creation. MIT Sloan Management Review, 293, 9. 1988. Creating organizational order out of chaos: Self-renewal in Japanese firms. California management review, 303, 57-73. 1986. The new product development game. Harvard business review, 641, 137-146. 1986. The application of organizational learning theory to Japanese and American management. Journal of International Business Studies, 173, 127-147. 1985. Japanese management: what about the “hard” skills? Academy of Management Review, 102, 181-191. 1985. Assessing the impact of country of origin on product evaluations: a new methodological perspective. Journal of Marketing Research, 388-396. 1984. Managing the new product development process: how Japanese companies learn and unlearn. Division of Research, Harvard Business School.